Ah! 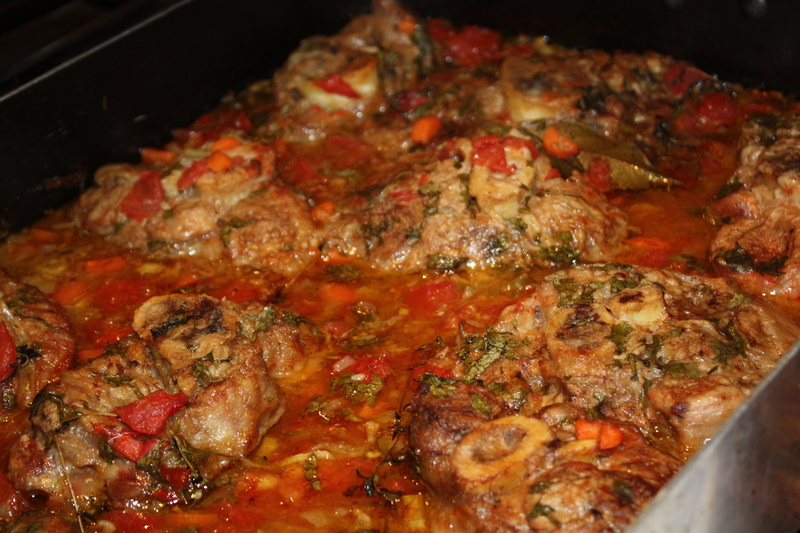 The traditional Northern Italian dish: Ossobuco; veal shank cooked in broth and wine and seasoned with vegetables and herbs. Mmmm! Eleven years ago this week, one week shy of my first wedding anniversary, my husband Emilio attended a fishing tournament in the Dominican Republic, so I took off to a mother and daughter weekend getaway to the Spa at the Disney Institute in Orlando, Florida. I believe this place is now open exclusively for corporate events, but at the time we attended, they had photography, animation, film, art and cooking workshops along with the typical massage, facial and exercise routine commonly found in spas. 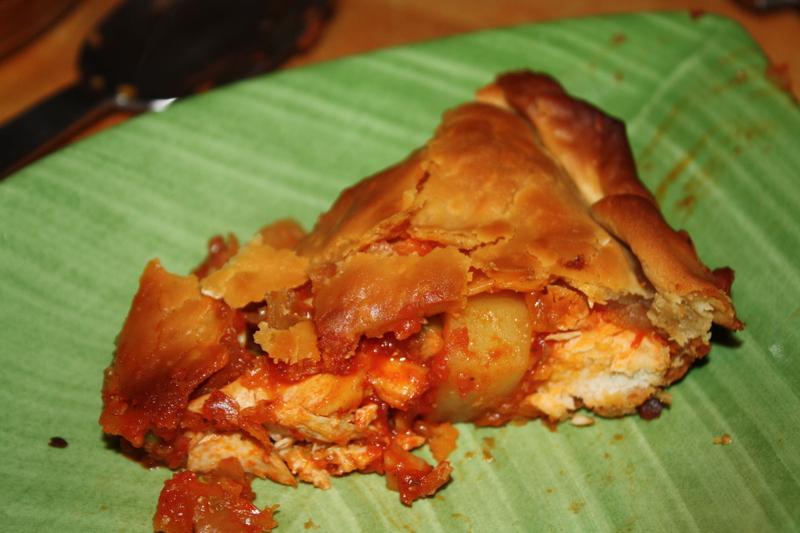 Of course, foodies after all, we chose the 3 day cooking workshop which that weekend was devoted to Italian Cuisine. We spent about 5 hours daily in the hands-on cooking classes and enjoyed olive oil and aged balsamic vinegar tastings. The chefs were knowledgeable and the facilities superb. 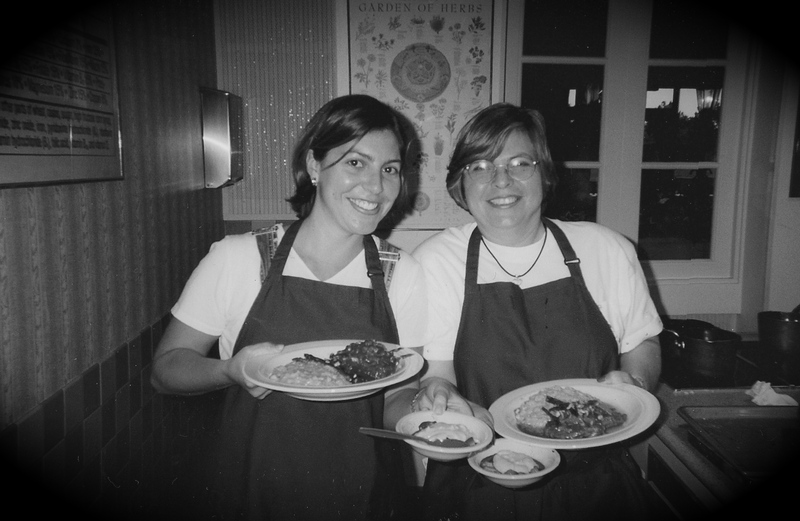 Each of us had our own cooking station, the ingredients were fresh and the assistants to the chefs always ready to lend a helping hand. 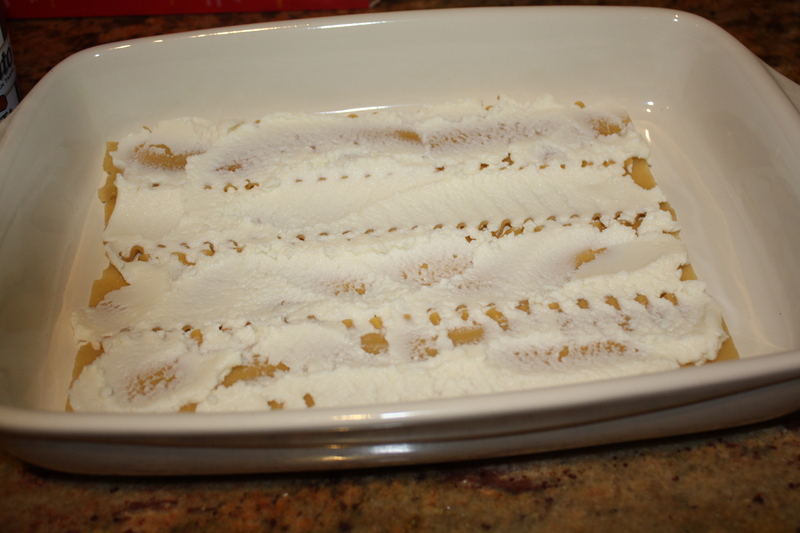 From the basic fresh egg pasta to Ossobuco, we learned to make traditional italian dishes that I have used as guidelines to cook for my family and friends throughout the years. 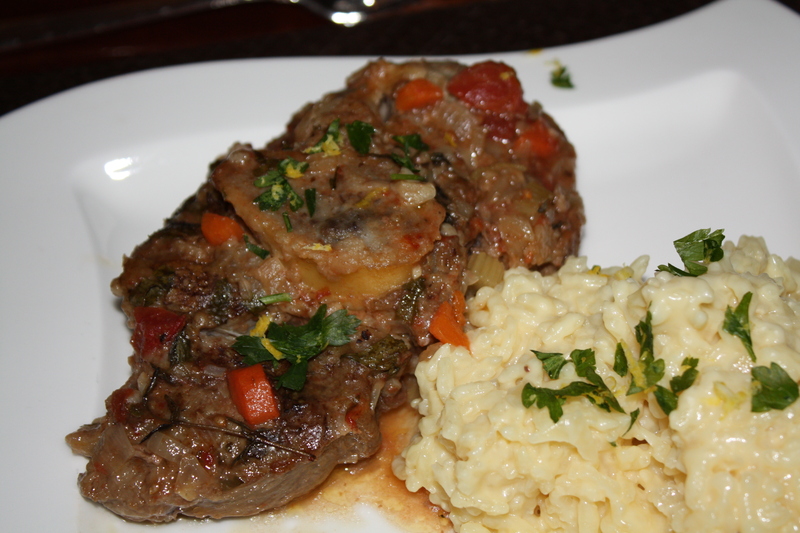 Ossobuco means “hollow bone” referring to the bone marrow of the veal shank used to make this dish. Veal is the meat of young cattle (calves). Its meat is tender, but the savory veal shank cut (lower part of the leg) can be a bit tough due to connective tissue and cartilage. This kind of cut is best when braised (cooking method in which the meat is first seared or browned in fat in high heat and then cooked in broth and/or liquid in low heat). 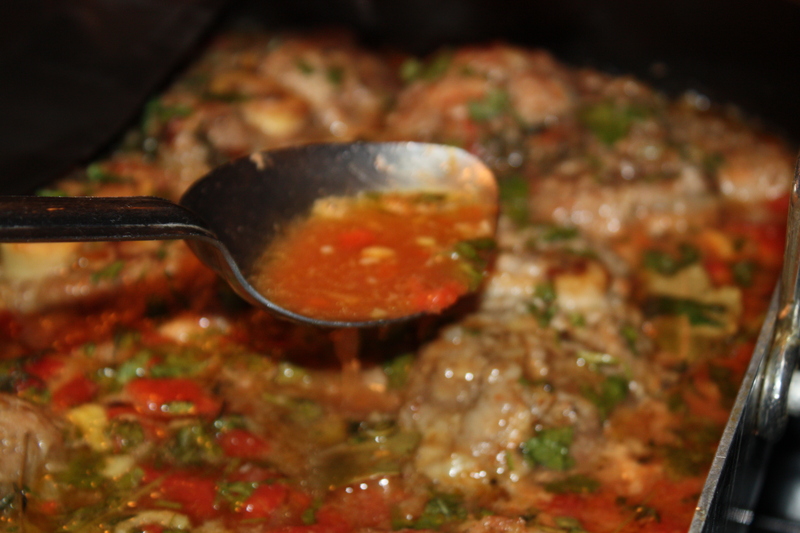 When the veal shank is braised, the meat becomes very tender (you will not need a knife) and the bone marrow releases collagen which is then turned into gelatin and along with the melted connective tissue helps in the thickening and flavor of the sauce. 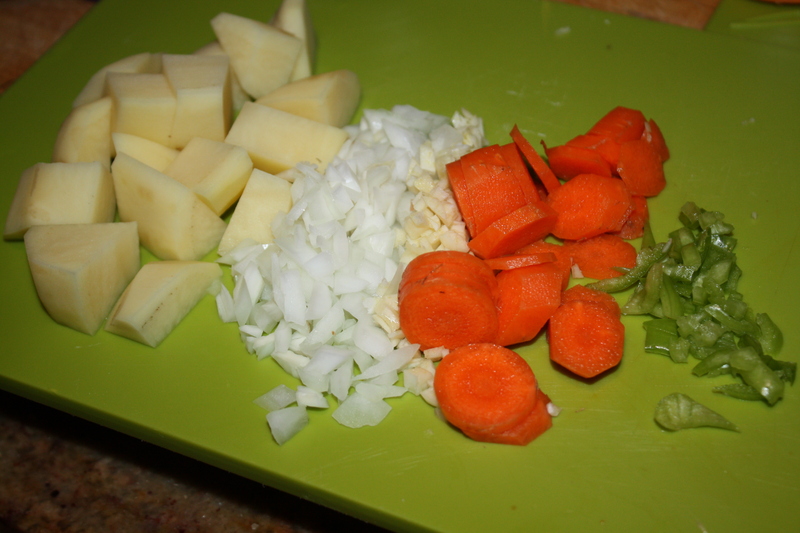 The sauce also includes the “holy trinity” of italian cooking; onions, carrots and celery. 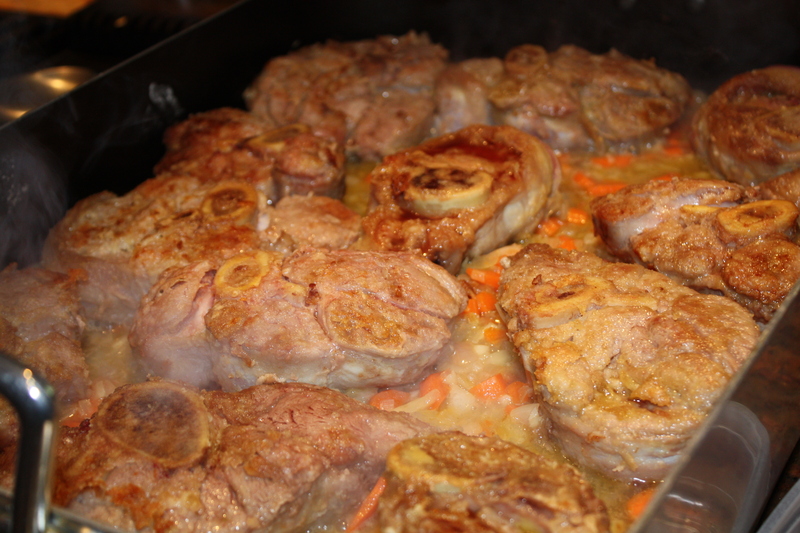 I only make Ossobuco when I have guests or for special occasions because it is a dish that takes a long time to make. 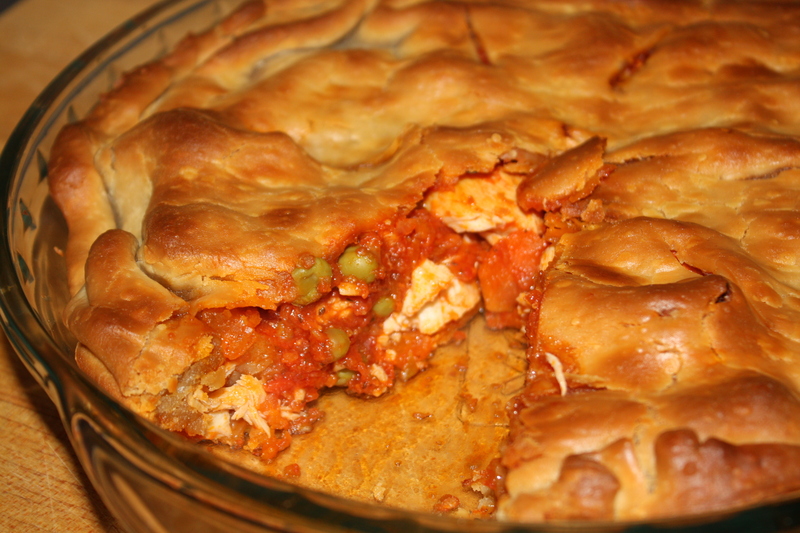 This is not something I would make during week days and I make sure I will not be rushed during the day I decide to make it. After I cut and measure all ingredients, I start to sear the seasoned-flour coated veal shanks in a large roasting pan over my gas stove. 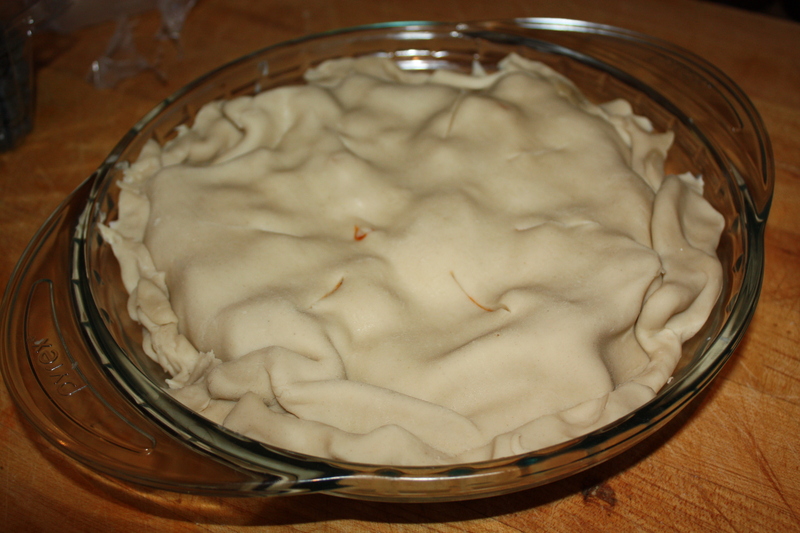 Then I cover it with foil paper when ready to put in the oven. If you make this recipe for 4 persons use a dutch oven or covered oven proof deep pan in which the shanks are close to each other and the liquid covers the meat at least half way up. 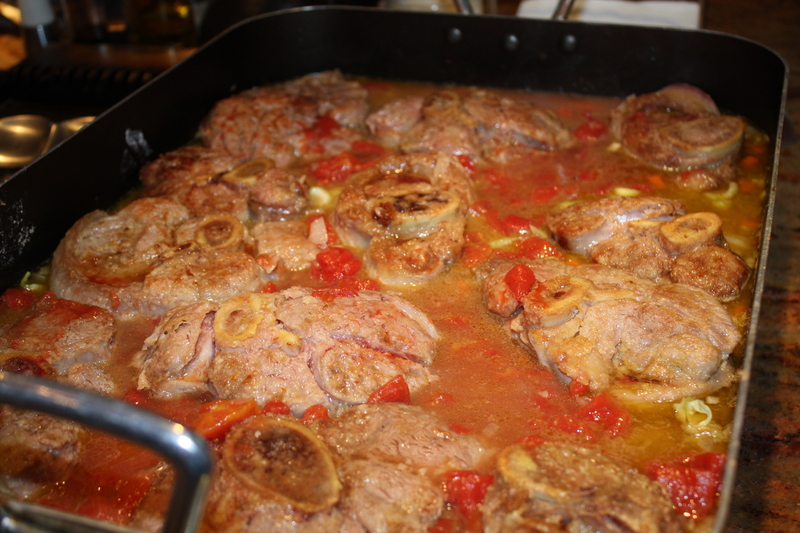 This modern version of Ossobuco Milanese goes well with mashed potatoes, polenta or Risotto Milanese. 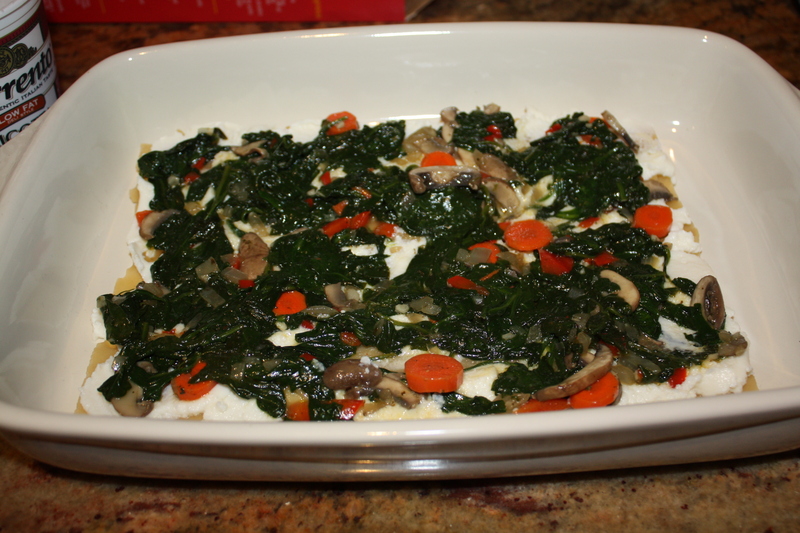 I like to sprinkle it with Gremolata. FYI, an older version of Ossobuco in Bianco (no tomatoes) is made with broth, cinnamon, allspice, laurel leaves, wine and Gremolata. 1. Preheat ovean 350º F.
2. 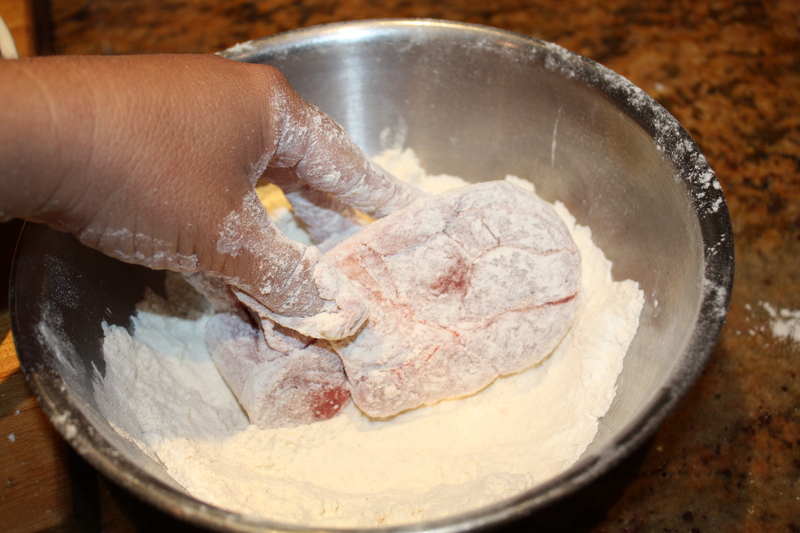 Mix flour, salt and pepper in a bowl. Taste flour to ensure enough seasoning has been added. 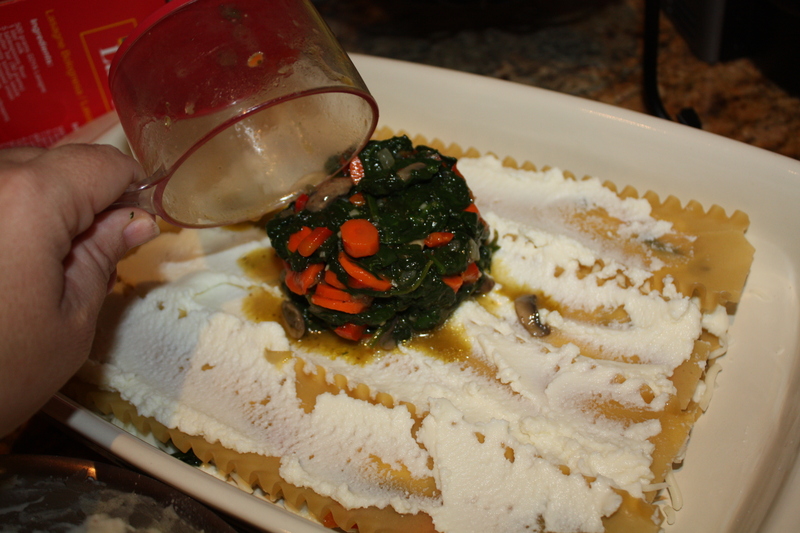 Proceed to generously dredge the veal shanks coating them evenly. 3. 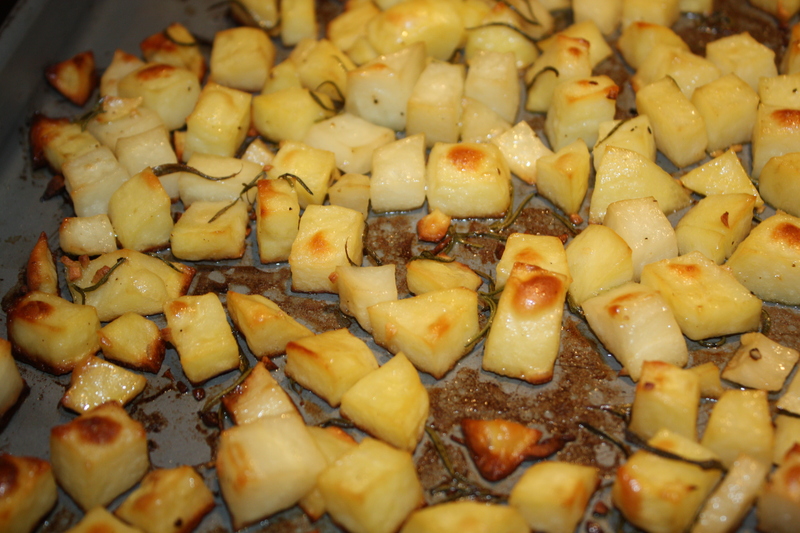 Heat extra virgin olive oil (medium) in stovetop just below smoke point. 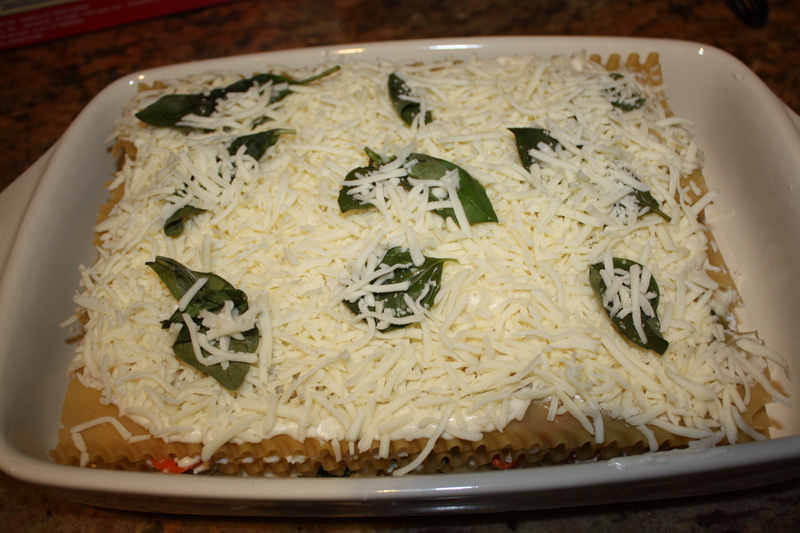 I use my large roasting pan when I make it for a large group of people. For this recipe, use a dutch oven, casserole or an oven proof sauté pan with lid where you can fit the veal shank close together and the liquids come at least halfway up the sides of the meat. 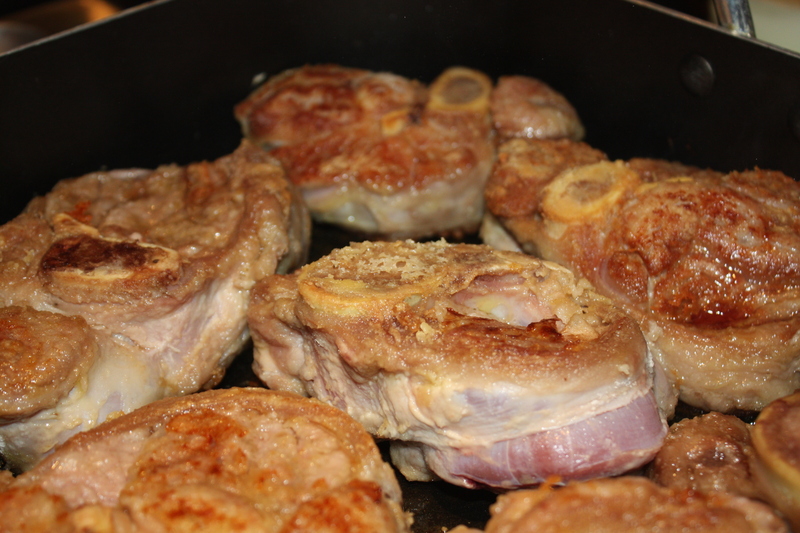 Add the seasoned veal shanks to the hot oil to sear until golden brown on both sides (about 7 minutes each side). 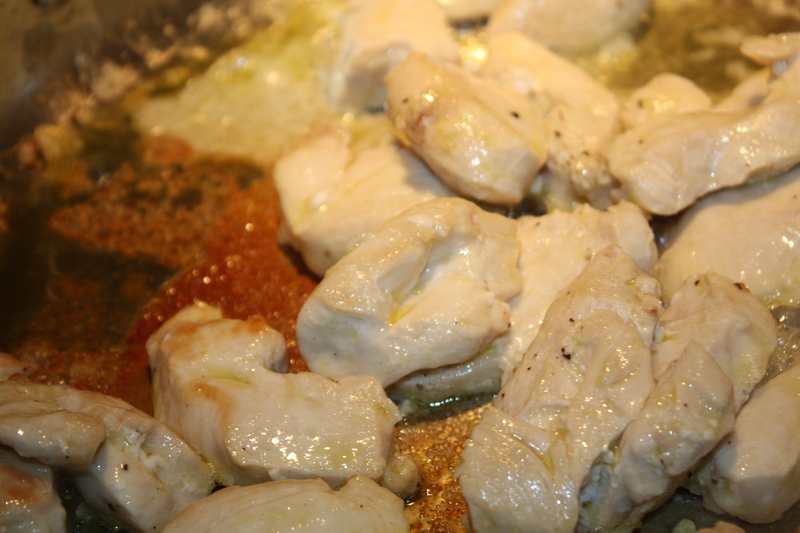 Once veal is browned, remove the shanks to a clean plate. 4. 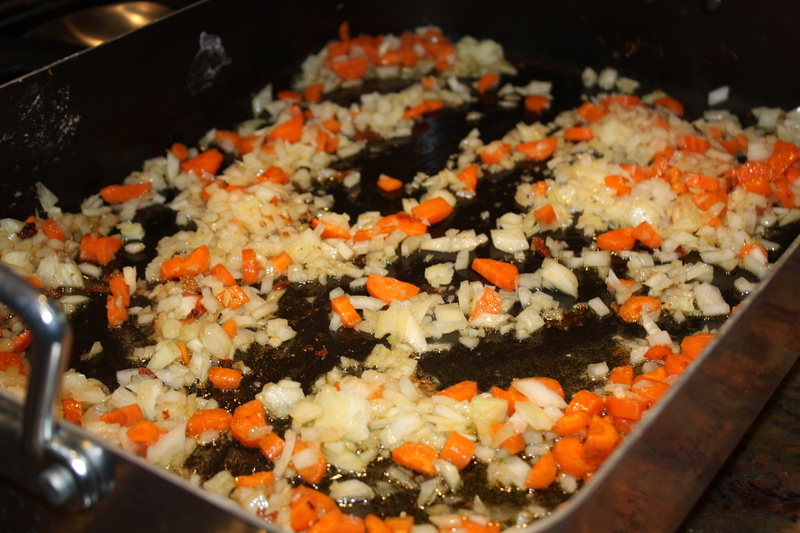 Immediately add onions, celery and carrots to the pan and sauté until onion is translucent and carrots golden brown. 5. 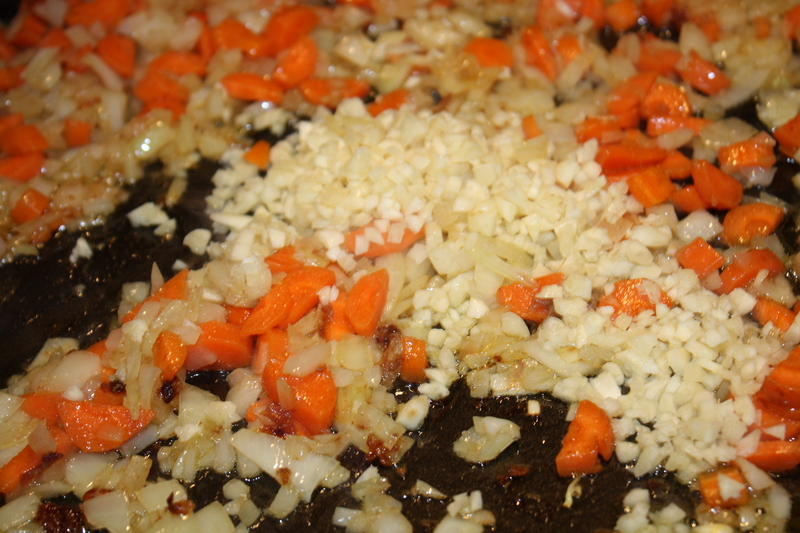 Add minced garlic and sauté briefly. 6. 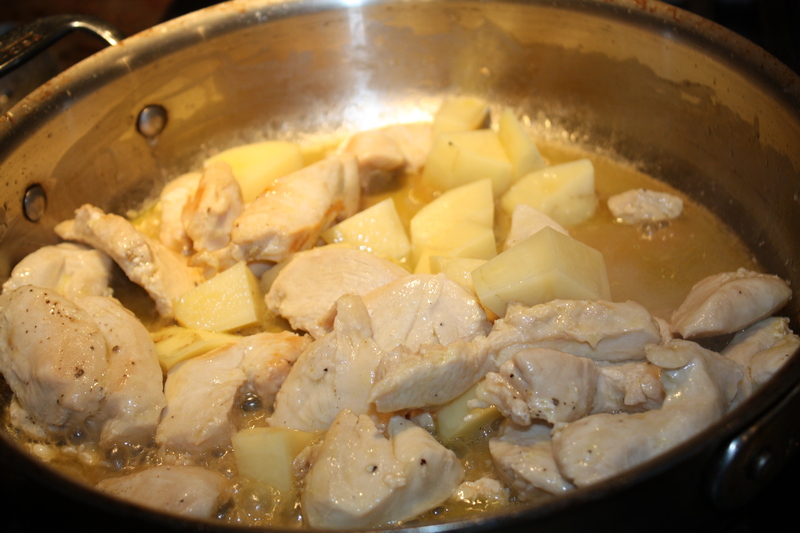 Add white wine to deglaze pan. 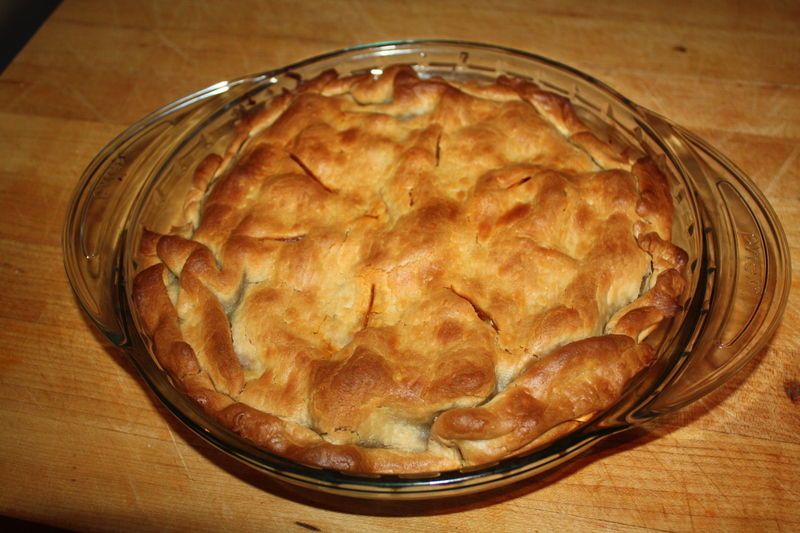 Scrape the bottom with a wooden spoon or spatula to remove all of the flavorful bits still clinging to the pan. 7. 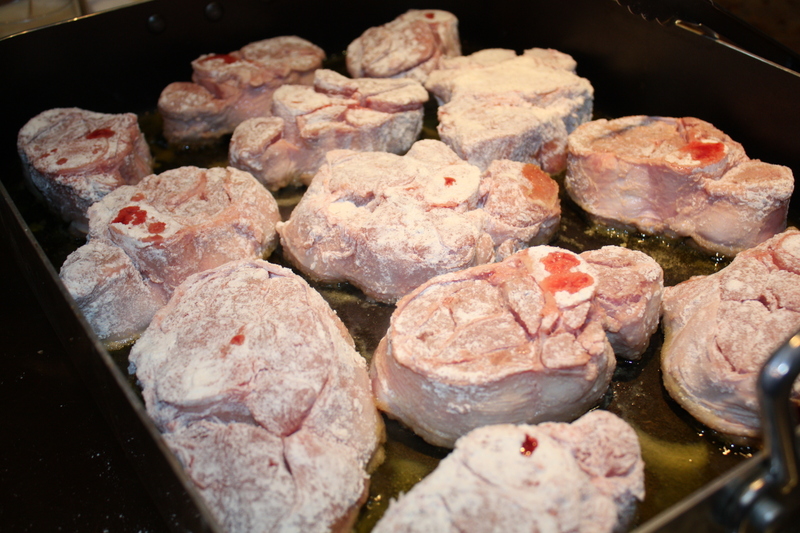 Return veal shanks and its juices to the pan and reduce wine by 3/4. 8. Add diced tomatoes, veal or beef stock and bring to a soft boil. 9. 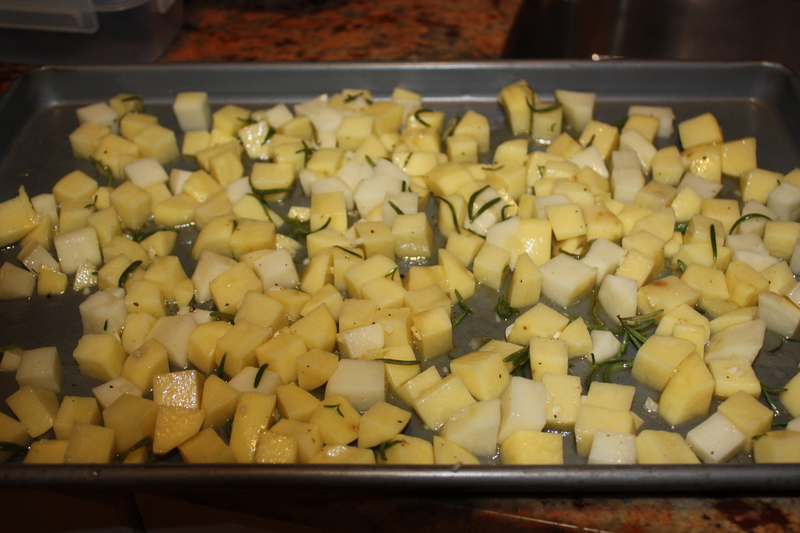 Add orange juice and herbs. Liquids should come at 3/4 up the veal shanks. 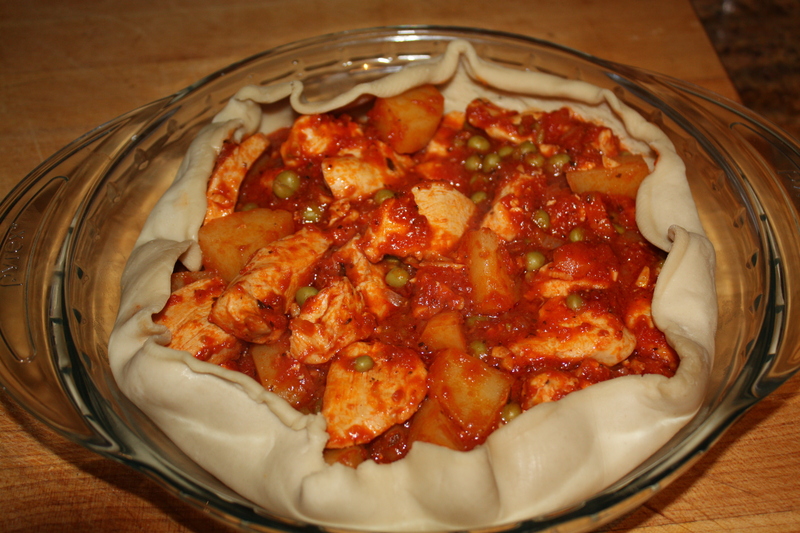 Cover and place in the oven for 45 minutes. 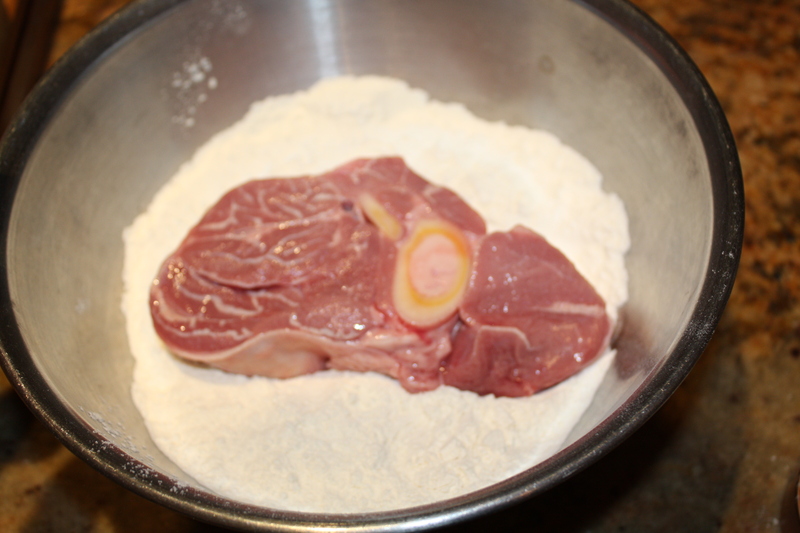 When timer goes off, check that enough stock remains to cover at least 1/2 of the veal shanks. Baste the meat with the juices which should be simmering gently. Reset time for 45 more minutes. 10. 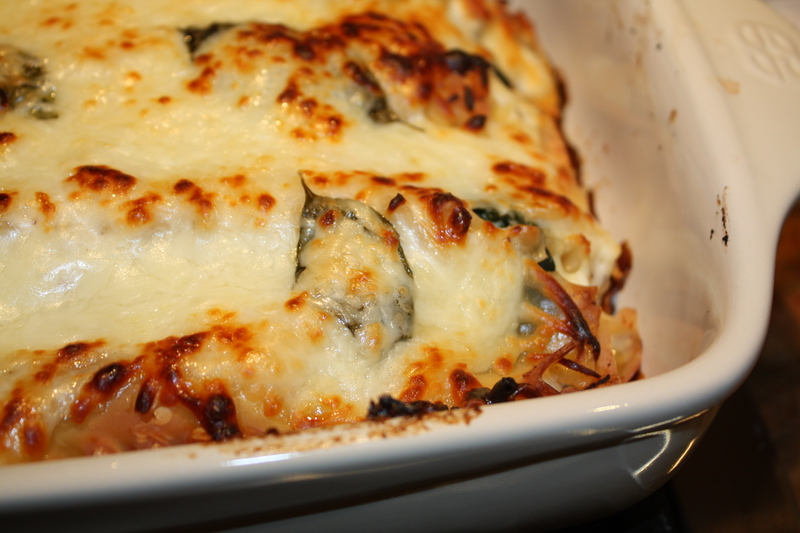 Remove casserole/pan from oven and check for doneness. Meat should fall readily from the bone. Taste the sauce and add more salt and pepper if necessary. 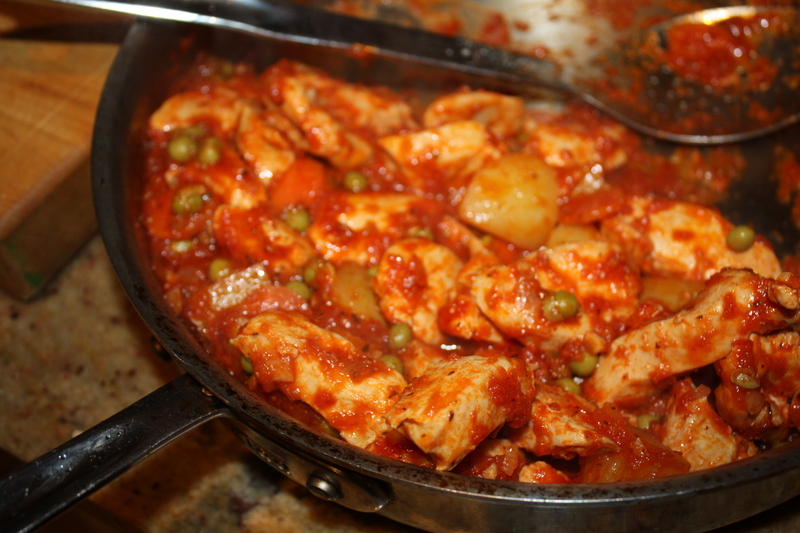 If sauce is too thin for your taste, remove meat form the pan to a serving dish or tray. 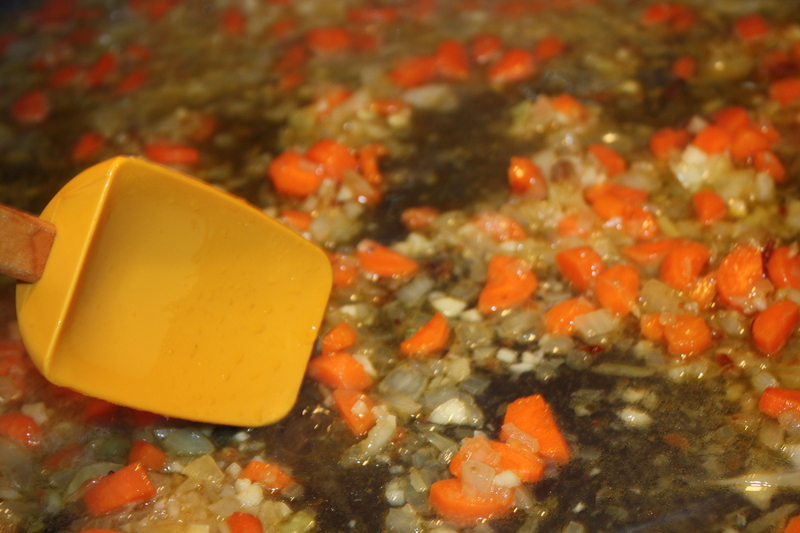 Place sauce in a small sauce pan and reduce to the desired consistency. Transfer veal shanks to serving plates and top with the sauce. 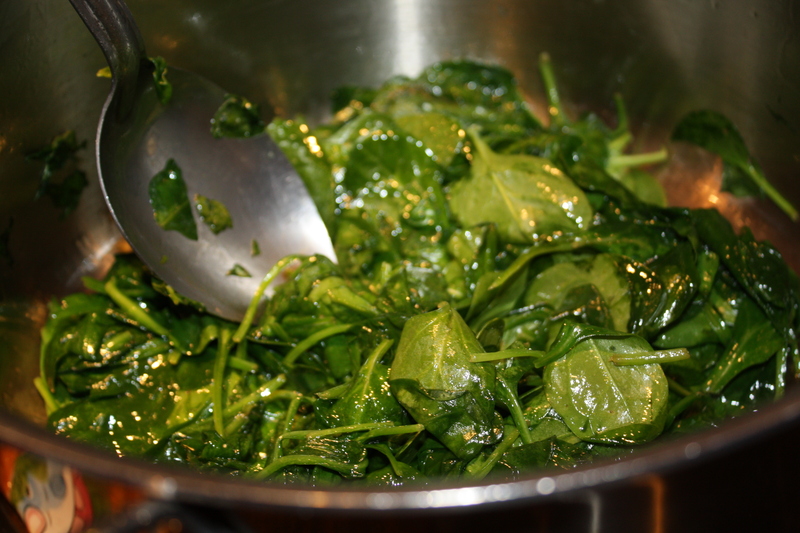 You may also garnish with Gremolata, a mixture of lemon zest, garlic and italian parsley. 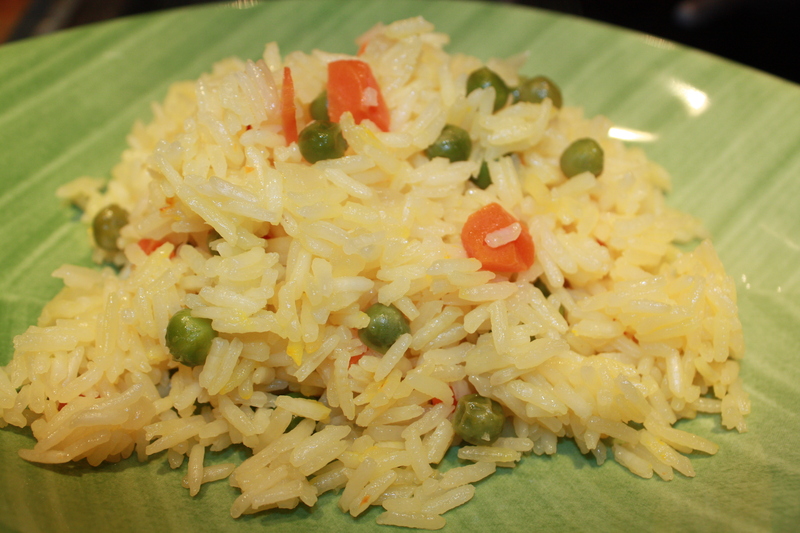 Rice is one of the foods that most cultures around the world have in common. 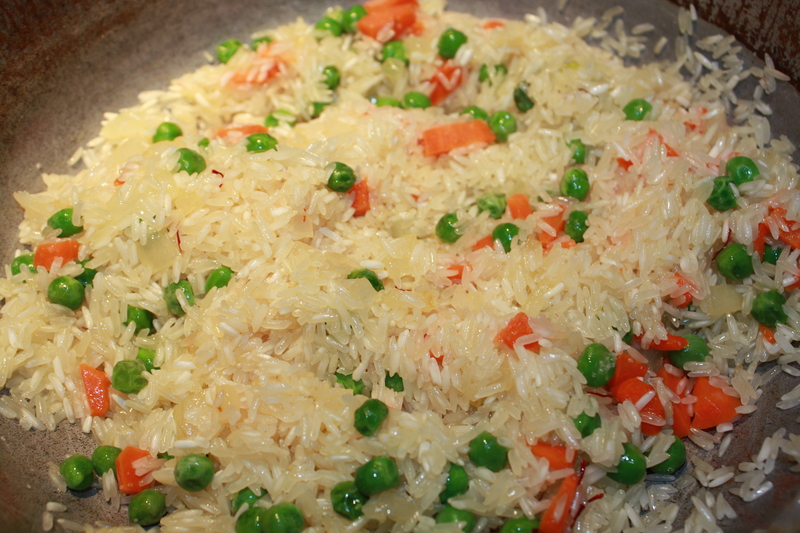 The difference is the method each prepares or seasons the rice. I like rice in any “way, shape or form”. Ja! However, I make it only once or twice a week as opposed to almost every day like my mother used to while I was growing up. 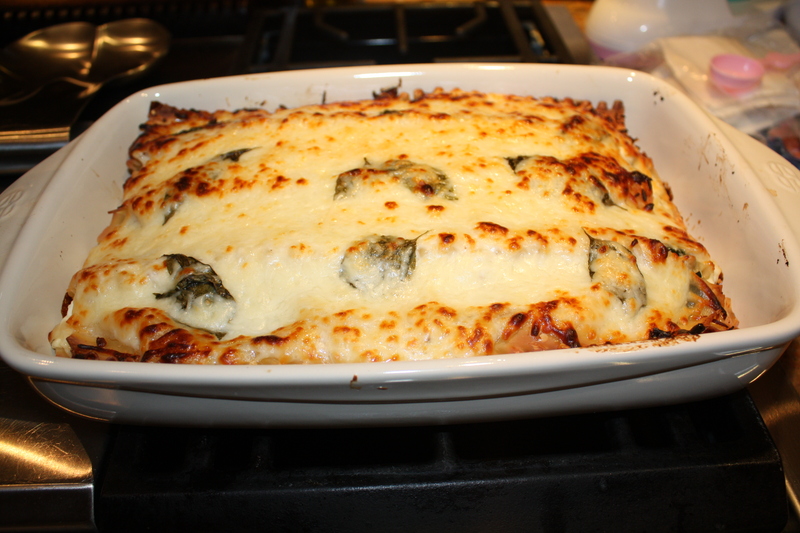 As you can see… I like to mix things up a bit in the kitchen. 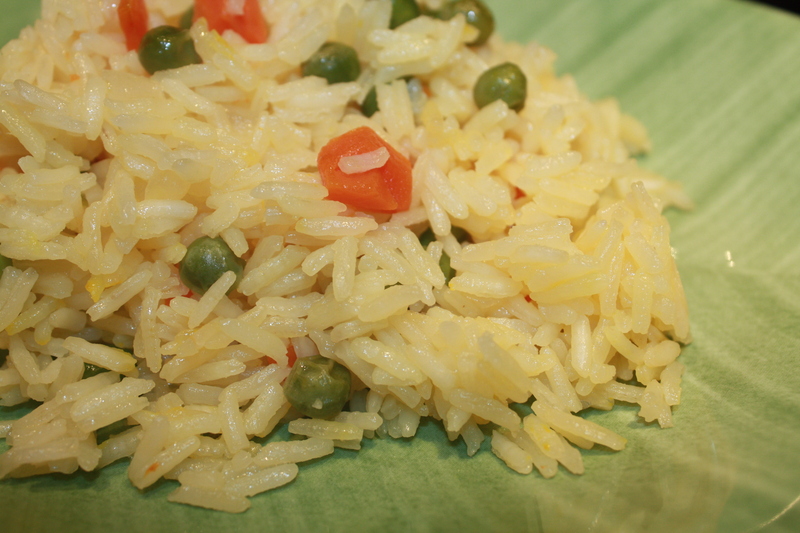 Jasmine Rice, a variety native to Thailand, is very aromatic and tastes delicious cooked just plain. 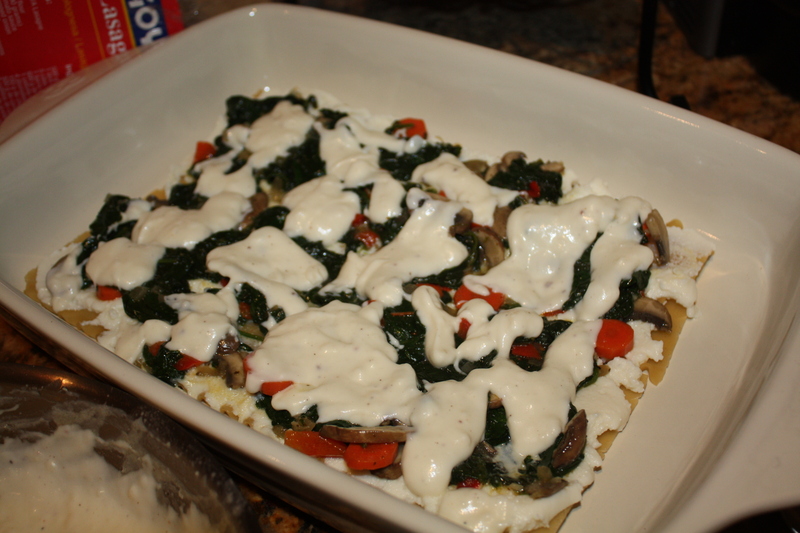 I also like to make it with vegetables as the main dish. 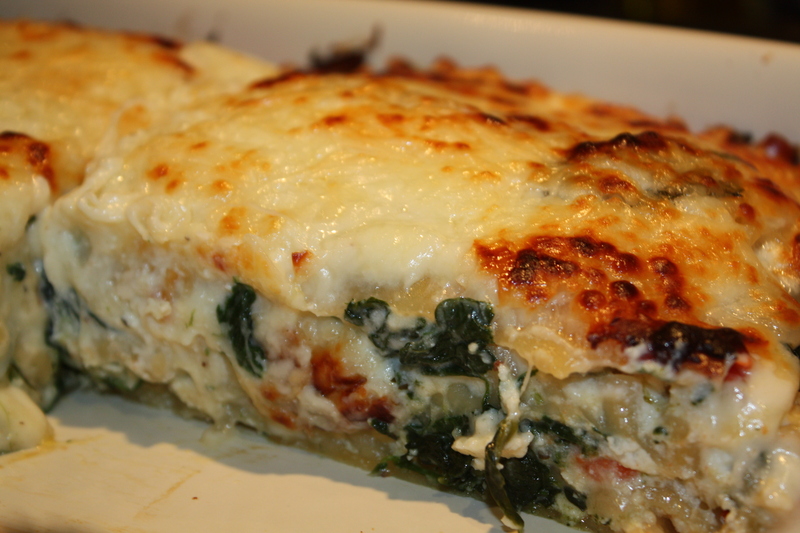 It is a satisfying, flavorful and colorful dish. Jasmine rice will cling but not stick too much due to a lower amount of starch in its grains compared to other varieties (of course when cooked properly). 1. Warm up water a bit in microwave. Place saffron threads in water and allow to bloom. 2. 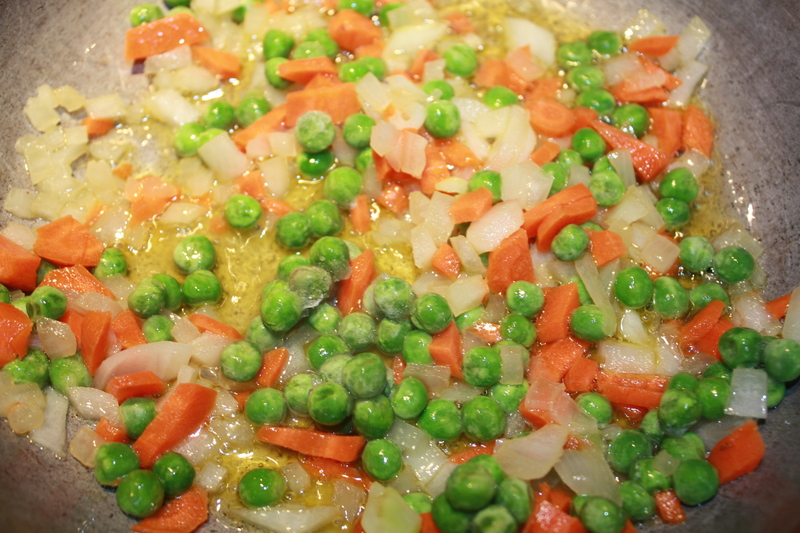 In a heavy sauce pan or “caldero” heat (medium) extra virgin olive oil and add carrots, onion and green peas. Sauté for about 3 minutes until onion is translucent. 3. Add rice and sauté for about 2 minutes over medium heat. 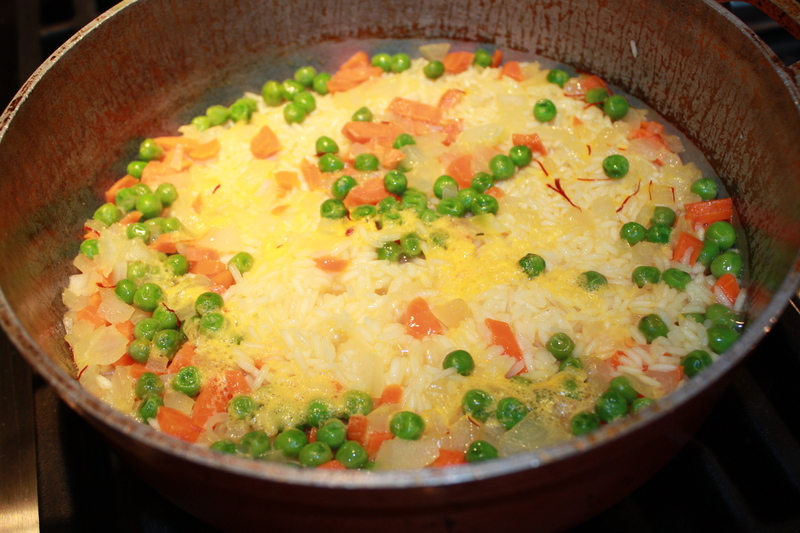 Add water-saffron mixture, vegetable broth and salt. 4. Allow water to evaporate and then stir. Bring heat to low and cover until done.